Paul McCartney is Dead: Music's Most WTF Conspiracy Theories, Explained . Beatles Radio: The Beatles, Solos, Covers, Birthdays, News The Fab 4 and More! The bigger the name, the weirder the theory. Paul McCartney became a household name when he rose to prominence as part of the Beatles in the 1960s, and his star power has held steady ever since the band broke up in 1970. But some conspiracy theorists believe that the Paul we know and love today is not Paul at all, but "Faul," or a faux Paul McCartney. According to a longstanding theory, the real Paul McCartney isn't the septuagenarian still tearing up stages – he actually died in the early hours of November 9th, 1966, after his car skidded off an icy road and crashed into a pole. Conspiracy theorists claim that John Lennon, George Harrison and Ringo Starr worried about how his death might impact the Beatles' huge commercial success, so they covered up his death by replacing him with a lookalike named Billy Shears, who looked, acted and even sounded the part. Extreme theorists have pointed to discrepancies in older photos of Paul and more recent photos, claiming that details like chin shape or the placement of his ears are dead giveaways. 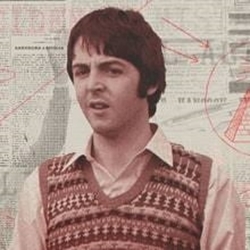 "Faul's" head size and shape are also supposedly different from McCartney's. Some theorists even go as far as to say Shears was an orphan who had once won a McCartney lookalike competition.